In the model as illustrated in Fig. 2, small circle C has a circumference that is 45º of latitude. We will be using the conventional terminology where a circle on the surface of a sphere that is made by the intersection of the sphere with a plane passing through the sphere center is called a great circle. All other circles, where the intersecting plane does not pass through the sphere center SO, are called small circles. If we view the model such that the equator of sphere S is the intersection of the surface with the tan-colored plane, and where the main axis of the sphere is along the intersection of the green-colored and magenta-colored planes, then circle C can be said to be tilted 45º from the natural orientation of a circle of latitude. 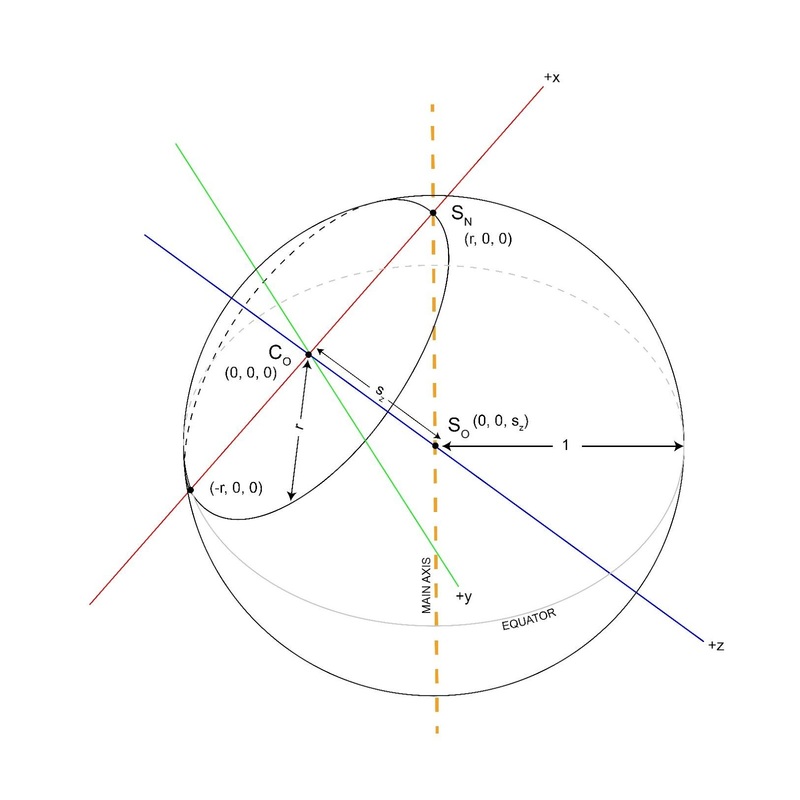 In this case, circle C intersects the north pole SN and is tangent to the equator. The center CO of circle C, together with point SO and point SN, form angle ∠COSOSN. There is a main axis passing through SN and forming one ray of this angle which we’ll call the cardinal axis, and there’s another axis that passes through CO which we’ll call the ordinal axis. The relationship between these two axes is that they are 45º to one another in the instance shown, but a similar model can be constructed using a small circle that is other than a 45º latitude. 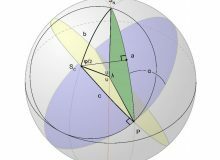 As an example, there could be a small circle with a circumference of 10º that is tilted to an angle of 10º from the horizontal, and this circle will also intersect the north pole. In this case the angle between the cardinal and ordinal axes will be 10º. This angle between the cardinal and ordinal axes is the upsilon angle, . A “casual observer” would think that the initial position of the colored rectangles (Fig 1) represents the planes defined by the coordinate axes (the xy-, xz-, and yz-planes). However, that’s not the correct interpretation. 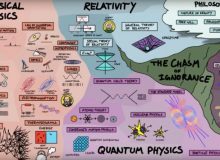 The point where the rectangles meet (Fig. 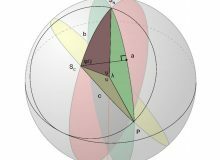 2) is the center SO of unit sphere S, having position (0,0,sz), and is not, in general, the origin of the coordinate system (0,0,0). Circle C is, in general, a small circle, and is the intersection of the xy-plane (which isn’t a plane indicated by any of the animated rectangular planes) and sphere S. Its orientation can be regarded as a circle of latitude of a specific size (in the example, 45º that has been tilted by the same angle (45º) such that it intersects north pole SN of sphere S.
Circle C can be described as the base of cone N (not shown), having sphere center SO as the apex, having the ordinal axis as the cone axis, and having the cardinal axis as a generatrix. Line COSO lies along the ordinal axis and line SNSO lies along the cardinal axis. In the model as illustrated, the angle between the axis of cone N and the axis of sphere S is 45º, giving an aperture of 90º (maximum angle between two generatrix lines) but this angle is variable. The axis of cone N is the z-axis. 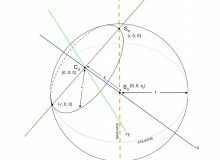 The circle center CO is the origin of the coordinate system (0,0,0). The y-axis is oriented such that the positive y-axis is toward the viewer in the illustration.